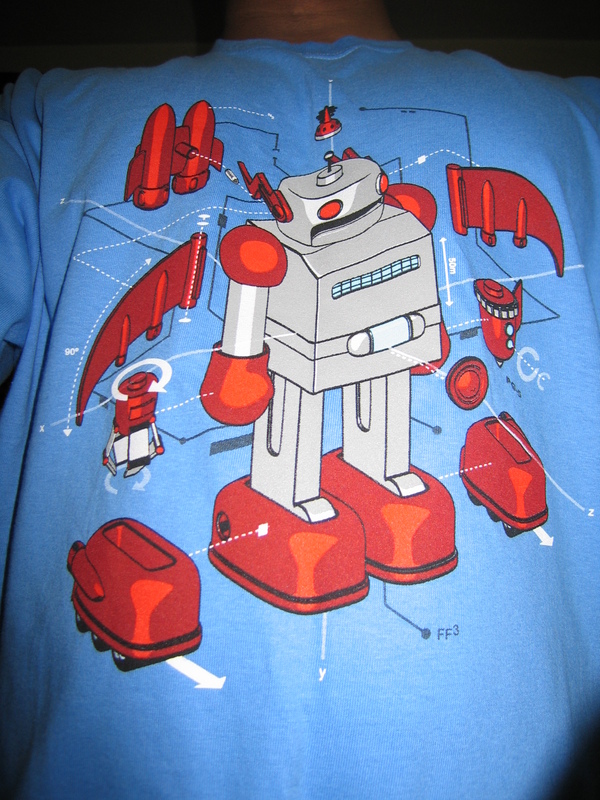 A couple of weeks ago I lost this site due to human error. Unfortunately I had no backups at all (big mistake, duh) and have only just managed to restore most of the site by hand. I restored the blog posts using Google cache and a friend’s Akregator cache, I’ve had to painstakingly re-post each entry. Other parts of the site which hadn’t been moved over to WordPress were safe on my machine and I restored those immediately, though I did lose all “in progress” conversions of these pages. Had a few files missing all over the site, some which I discovered as late as today 🙁 For all of you who took the time to comment, sorry, lost those. On the brighter side, I’ve invested all of $.05 in Amazon’s S3 service and will be storing weekly backups there. Around 8 years ago, I got my first license, for motorcycles. Everything looked kosher until I noticed my name incorrectly spelt as Brain. I decided to live with it and have used it as proof of age and proof of residence several times, nobody seems to notice the mistake. So when I started driving lessons, I made sure my name was correctly spelt on the learners license I was issued at the beginning. On the day I completed my driving test, the driving school filled out additional forms and I checked the spelling, again. I asked if I needed a new photo and they said it wasn’t necessary, all details would be taken from the learners license, including some biometric details and my mug shot. 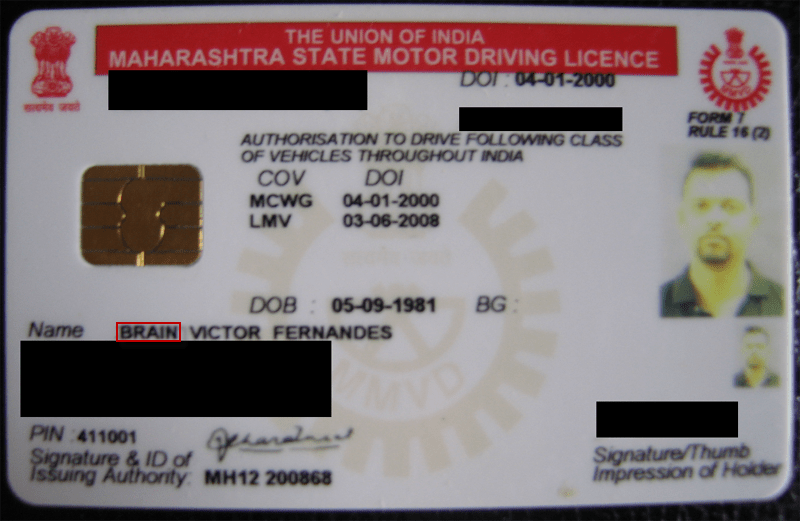 So I didn’t bother highlighting the problem in my older motorcycle license. My mistake. All details were copied, except the name. Hooray! 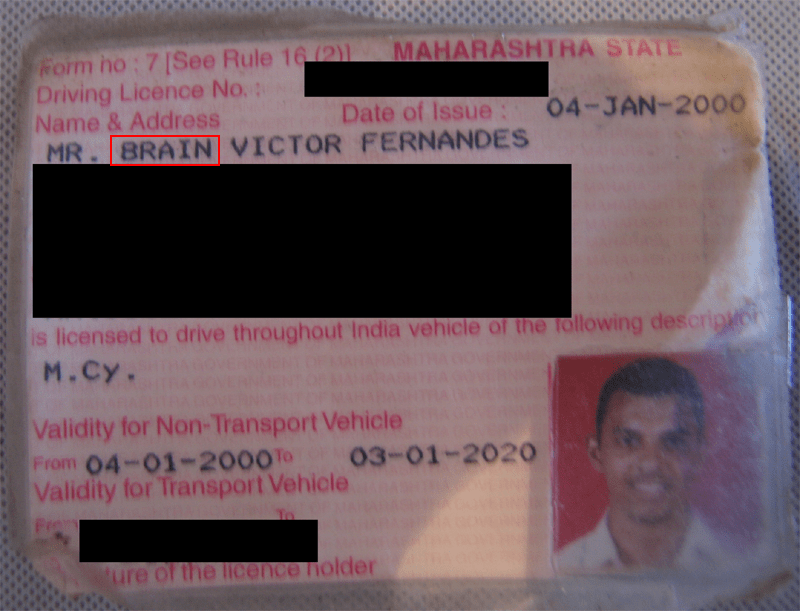 So, I’m stuck with this for another twelve years… Brain Victor Fernandes. Cool beans when you’re eighteen, irritating when you’re twenty six. I can get this fixed, of course, but I’d like to know how much longer this will continue to be accepted everywhere. Hey, remember to check back in twelve years for the results! So, probably 3 whole years after I should have, I finally have started my own blog. 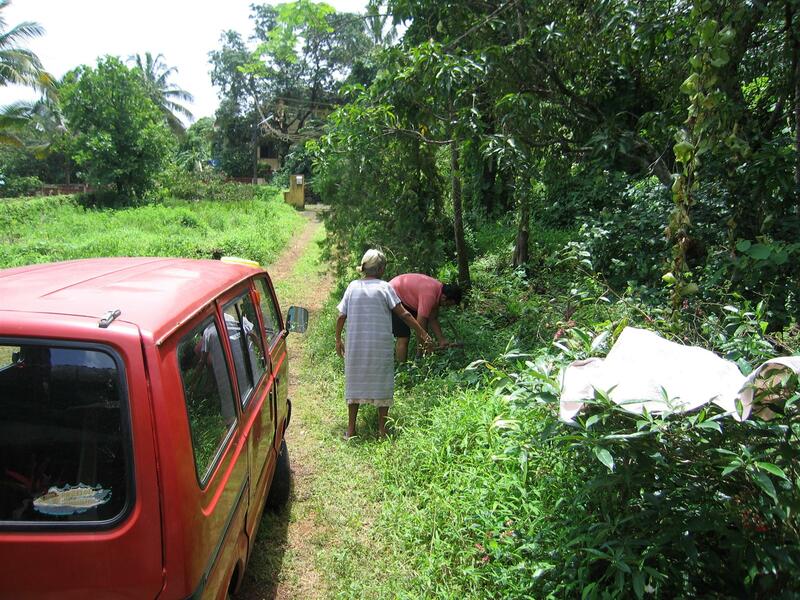 I was holding off until I could write my own blog/wiki hybrid article site, but realized I will never have the time to work on either the framework or the articles, so here it is – The Goan blog. I hope to write about my ongoing experience as a MyEclipse developer, my own little hobby projects, technology and a few occasional rants. 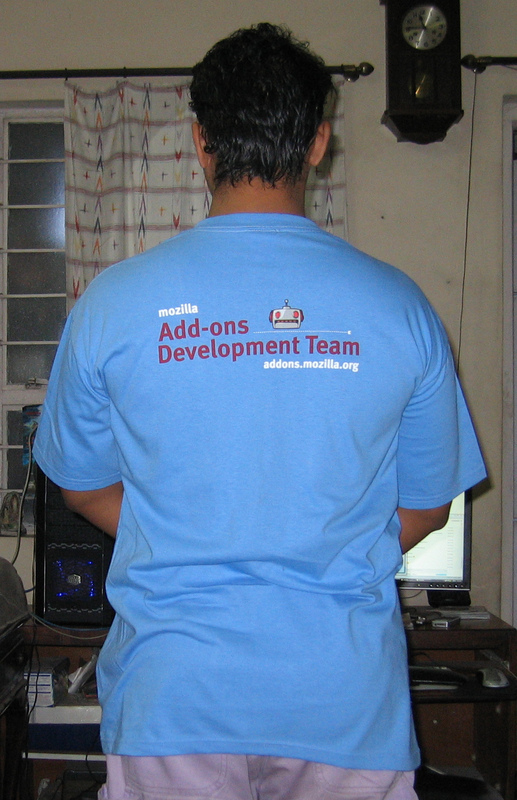 Probably write some more about life in India, driving and other stuff (stopping here or this post will never get out). Thanks to my friends, Riyad and Sushubh for encouraging me to start blogging; if you don’t like this blog, blame them, otherwise, enjoy!